We used different types of coffee makers in the past (dip brew/filter coffee, French press, etc.). 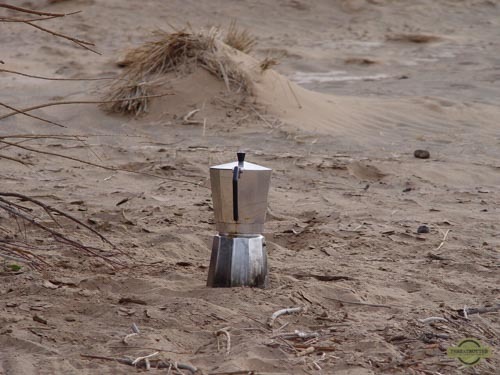 The Italian stove top espresso maker, also called the Moka pot or Italian press, is by far our favorite. Tip 2: Grind your coffee beans a little coarser than for an espresso machine to prevent sediment in your brew. Note 1: We received our current one (image above) as a gift from other overland travelers. For us it is the perfect size: We can make 2 cups of coffee with it (or 3 espresso cups). Pouring the coffee without spilling is a little tricky with this one, but we can live with that (for us not a reason to buy another one). This particular espresso maker does not work on an induction plate. 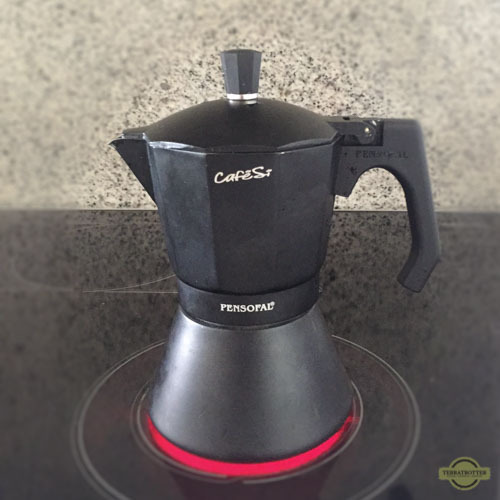 Note 2: If you don’t like the boldness of espresso style coffee, than this is not the right coffeemaker for you.